Include this page with your application and ordering form when you Mail In, FAX In or E-Mail your Application to us as a PDF or JPEG attachment. If you Call in your Application be sure to mention these FREE Bonus items. 2. Ordination Letter on Parchment Paper with Gold Seal. Free Certificate of Accomplishment or Letter of Good Standing with the Basic Package and Clergy (Minister) Packages 1, 2 and 3-B. Click the above Blue Button to Apply. 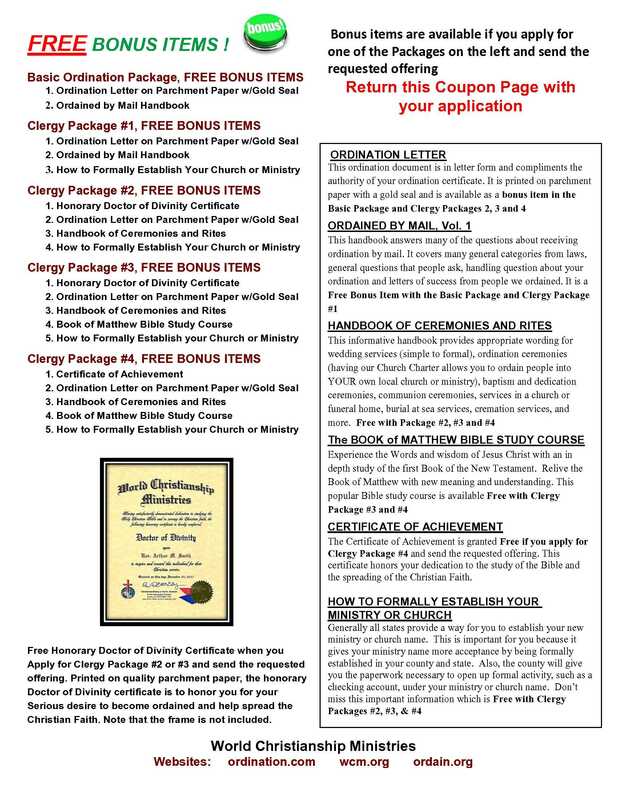 * Bonus items are available only if you apply for one of these Clergy (Ordination) packages and send the requested offering.